My Fabulous CVS Drugstore Find! Lucky me– I was out on a walk earlier this week and happened to stop by my local CVS drugstore for some retail therapy. 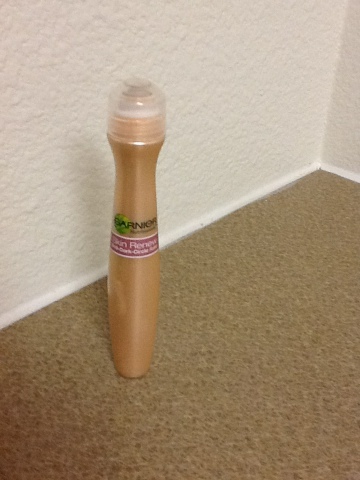 As luck would have it I found a miracle in a tiny container– Garnier Skin Renew Anti Dark-Circle Roller. I figured for $12 it was worth a try. Definitely fit into my thrift shopping mindset. I’ve been using this for the past three days. All I can say is– amazing! It looks like I won’t have to schedule time with the surgeon for awhile. This entry was posted in Retail Therapy and tagged CVS, cvs drugstore, Garnier skin renew, plastic surgeon, raccoon, raccoon eyes, retail therapy, slim budget, tiny fixes. Bookmark the permalink. 2 Responses to My Fabulous CVS Drugstore Find! I love this stuff! I have two so that I can keep one in my purse for touch ups.